"This is a Scottish dish that is traditionally a thick soup. I prefer it as a thin stew and have adapted my recipe accordingly. I use the entire leek (needs to be cleaned very carefully), but the green tips tend to be a bit tough so you might want to add them earlier in the process if you want to soften them up." 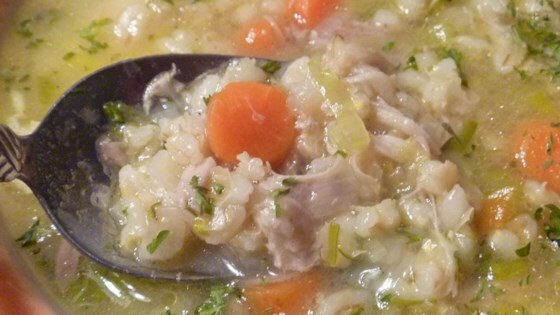 My son and I enjoyed this recipe but neither of us is crazy about barley. I thought I'd try it with brown rice. Added some mushrooms, onions, and celery to this and it turned out wonderful. This was really easy to make, and it was delicious. I made it with chicken thighs rather than a whole chicken, and it worked out just fine. A great winter dish! I didn't think that -a-leekie should be thin like a soup. I cut back on the water and used grilled chicken breasts instead of a whole bird. Otherwise, great dish!